China Candles! Guan Candle Making Machine Co.,Ltd. The Birthday Candle Proudction Unit consist of Wax Pulling Machine, Titanium Dioxide Coating Machine, Cooling Channel Frame and Main Machine. It is fully automatic. The Main Machine can adjust the length of the candle by the numerical control and sharpen the candle tip automaticly. 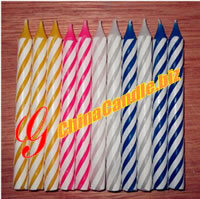 The unit can make the birthday candle with single color or double colors, in the shape of the spiral, flute or plain. The tip of the candle can be adjusted. The unit has the advantage of high precision, multi-function, high efficency, energy conservation, working smoothly, easy operation and easy maintenance. Melt the solid into liquid, then supply it to the candle making machine or the paraffin powder spraying machine. The equipment to make the T-light shape candle, votive shape cadle, pillar shape candle by express, automatic one. Needs the paraffin powder as the raw material. The equipment to make chalk or crayon. We are the manufacturer of the candle, crayon and chalk making machine. All content copyright 1997-201７ The Guan Candle Making Machine Co.,Ltd.